Here’s a bread, Crusty Bread Easy Overnight, done in its simplest form. 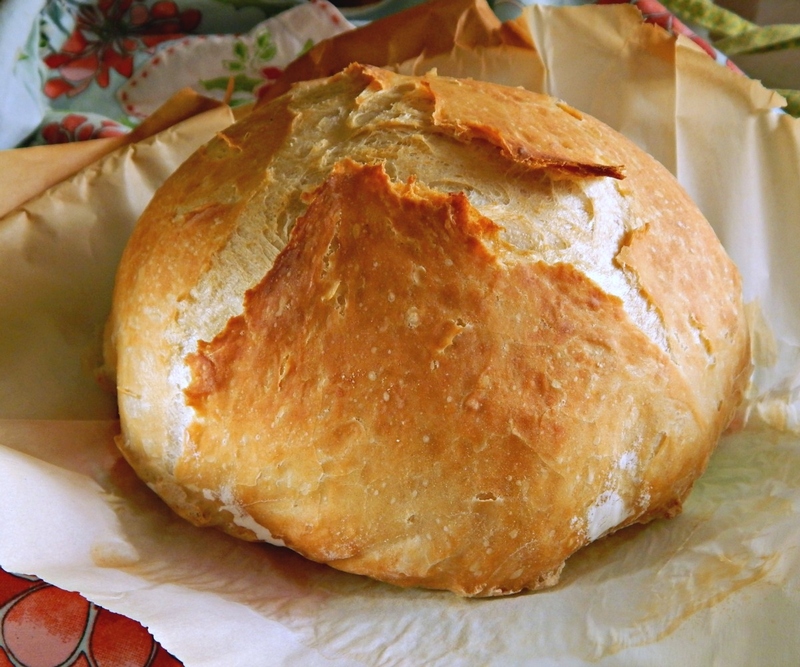 Sometimes you’ll see it called Pot Bread, Artisan Bread, Overnight Bread or No Knead Bread. They are all names for this super easy, quick to mix, no-knead bread that slowly rises overnight and gets popped in the oven the next day. Crusty Bread, Easy Overnight is kind of a miracle, one of the most basic breads you could ever make with only four ingredients, but you’d never guess it from the taste which is divine and the texture, which is amazing. There’s that crust for one, and then the holey, kind of chewy dense bread itself. I just gotta mention that crust a little more. I mean that’s why I call this bread crusty! You all know or maybe you were one of those kids that took the crust of the bread? Not this bread. I think it’s the best part. I’ve had people ask for more, only to pick off the crust and eat it. And ya know you’re ALWAYS supposed to wait for bread to cool, right? We have never had the willpower. We’re cutting it up and digging in as soon as we can safely do so. If I want to serve this for dinner, I have to make two because it never lasts. And there’s no sense in hiding it because I’m part of the problem the smell of freshly made bread wafting through your kitchen is a dead giveaway! I’m a food blogger. I’ve made more complex, perfect and/or showy bread. I’ve gone through stages when I’ve fermented my own wild yeast for sourdough, fooled around with bigas, French ferments, misting, cooking stones & bricks, but I don’t really do that any longer – too much babysitting, too much time! This Crusty Bread, I make all the time because it’s delish AND it’s do-able. I love that it’s rustic and each loaf seems to have its own personality – it’s so fun to open that pot and see what you’ve got! Flour, Salt, Sugar, Yeast, Water, the recipe couldn’t be easier or more “hands off.” Not including the (admittedly long) overnight wait time for the yeast to work its magic, it literally takes 5 minutes to mix. This is one of my favorite kind of recipes, low effort, and high payoff. Just a note of caution! You’ll be working with a heavy, screaming hot pot! You’re going to bake your Crusty Bread Easy Overnight in a plain cast iron or enameled cast iron Dutch oven. Make sure you have a place to set it when you take it out of the oven and a place to put the lid – two clear burners are probably the safest place. Over the years I’ve come up with some improvement to the basic recipe to get just a little bit better results. One of those is using parchment and the other is slightly shaping the dough by using your hands, pinkies and the edge of your palm down, to push in at the bottom of the dough, turning it a bit as you go. That makes the dough a bit tauter and helps it keep a nice round shape with an interesting crust. I give it a couple slashes, too, but don’t go too deep or the crust will get a bit free form like the pic towards the top of the page. Still delish, though. If your kitchen is cold you will need to let your dough sit on the counter more than the preheat time of the pan, or put your parchment on a sheet pan or plate and place it on top of your oven as it preheats, being careful that you’re not creating a hazard with that parchment. This dough does not need to double – it has great “oven spring” and literally springs up in the first few minutes of cooking. Tossing a little water in the pan helps with that spring and helps form the gorgeous crust. I toss a bit on top of the dough and let a bit go down the side of the pan for steam. You are going to need An enameled cast iron Dutch oven, regular Dutch oven or any pot/pan with a lid that will withstand this very high oven temperature. If you know the make of your pan, check the manufacturer’s site (if you no longer have the booklet) to see if your pan will be okay.) If the problem is the plastic knob, remove it and cover the hole with a bit of dough to seal it. Don’t push it in where it could get caught in the threads, just press the dough lightly on top. Just don’t forget to screw the knob back on; it would be a shame to misplace it! An old-fashioned speckled casserole does work but gives just a bit of a strange bottom due to the indentations and the loaf usually is a little more free form than round. I haven’t tried this, but if your baking stone will take the temperature and length of time (and it should) it could be used with a stainless steel bowl as a lid – in this case, don’t toss the water on, but do mist, then pop the bowl over. Be very careful lifting up the bowl when removing it. A thin spatula and a pair of tongs will help. Fair warning, you might want to be aware that this recipe at its high temp can wreak a little havoc on your enameled pot. Barkeeper’s Friend is going to be your friend. Make sure your pot is perfectly clean before starting – any smudgy residue, for instance from the last time you used it, will darken in the high temps. And talk about cheap! When I first made this in April of 2012, my Crustry Bread Easy Overnight, ran about 25 cents. I’m guessing now, about 30 to 35 cents. A loaf of “Artisan Bread” at my store ran $4.99 in 2012, and I can’t even tell you how much a loaf runs for now. I never have to buy that anymore and haven’t looked at store-bought since the fateful day I came across this little recipe! That store bread, by the way? Not nearly as good, it was a pale anemic, dismal thing compared to this, and it only weighed a pound – if it were 1 1/2 pounds like this bread, it would have cost $7.49. Shop well for your baking items; I used to really stock up during holiday sales, like Thanksgiving, Christmas, and Easter but now I find great prices at Aldi. I never bring anything made of or containing flour into my home without freezing for 3 days or refrigerating for 30 to avoid “peskies.” The yeast I buy in jars and keep in the freezer. It will be fine for decades! Consider Crusty Bread as a Gift: This bread is great for a hostess gift or a gift for a friend, but beyond that, consider giving a young person his/her first enameled cast iron pan (something I didn’t even have until later in life) filled with a container of the premade dough, some butter in a butter saver or butter dish or a good olive oil in a pretty, reusable cruet, a small bag of flour & a container of yeast. And of course, a copy of this blog page! Walk them through the first baking, if possible. This simple, overnight Crusty Bread has a few little tricks to make it the best you’ve ever had, let alone made! In a medium-sized mixing bowl, measure out flour, salt, and yeast. Use a fork or whisk to mix together. Add water (see notes) and mix (a spoonula works great) until a shaggy mixture forms. Cover bowl with a lid or plastic wrap and set aside for 12 – 18 hours. Overnight works great and the timing is not particular. Adjust oven rack to the highest level that will accommodate your pan and allow you to easily get it in and out of the oven. When ready to cook, turn dough out, very carefully, without deflating the dough (nudge it with a spatula, gently, if it sticks) on a heavily floured piece of parchment paper that’s a little larger than the bottom of the pan. You’ll want the parchment to go slightly up the sides for easy removal of the bread. Flour hands and gently cupping at either side of the bread, keeping pinkies and sides of palm down, form a little, loose “ball” of dough by pressing in at the bottom of the dough as you turn it bit by bit. If the dough sticks, add a bit more flour. Cover with plastic (the same one you used to cover during the rise is fine) or a clean kitchen towel. Carefully place parchment on a sheet pan or plate and set in a warm place (perhaps the front, not the back, which is too warm, of the stove) to rest as the oven preheats. Preheat oven to 450 degrees, with the pan inside, lid ajar, for 20 minutes, keeping in mind ovens vary in the time it takes to preheat. You’re shooting for about 10 minutes after it gets to 450 degrees F.
Working quickly to retain as much heat as possible, remove hot pot from the oven and drop in the dough, parchment and all. Toss in the water, most right over the dough, but let a little go down to the bottom of the pan for steam and immediately place the lid back on. Return immediately to the oven and bake for 30 minutes. After 30 minutes, remove the lid and bake an additional 10 to 15 minutes until the top is golden brown (a few dark places are just fine.) Place on cooling rack. Just about any yeast, it seems, works in this recipe. My preferred is active dry, instant seems to work well, too. I’ve also used Rapid Rise and Bread Machine yeast. If you’d like, you may make three slashes across the dough with a very sharp knife before adding it to the pan. If the humidity is very low, which may happen, usually in winter, the amount of water may need to be slightly increased a tablespoon at a time until a shaggy dough is formed. You’ll know because your dough will be a tight ball rather than a shaggy one. This entry was posted in Click here for Fabulous Food Posts and tagged Bread, Crusty Bread. Bookmark the permalink. Quick question – What size dutch oven are you using? Thanks! I have used several different sizes and the only difference is the smaller one seems to make the loaf just a bit rounder – I’m going to go check the size…. Ok, Barb, the one I use the most is a 4 quart because that’s the one that’s always at the front of the cupboard and handy because I cook with it the most. If I make an effort to pull out my three quart, which is at the back of the cupboard, I do think the loaf turns out very slightly rounder. It’s hard to say because sometimes they’re nice and roundish, other times a little flatter and it may be due to variables other than the size of the DO. So long story short, use what you have. How’s that for a non-answer? Anyway, the recipe is very forgiving, a little free form so have fun! Perfect with soup! And I love traditions like those – I’ve made it with my cast iron Dutch oven, too. I have a very old one and I love it because it’s just the perfect size and not as heavy as my enameled one! Beautiful photos. One question though, why no sugar? Even a small amount. I’ve heard sugar helps ‘feed’ the yeast and giving it a good rise. Thanks! I think the no sugar is because this is such a very long and slow overnight rise. That slow rise helps develop the flavor of the bread, too. I think the reasoning is probably if it had sugar, it might rise to the point it collapses upon itself. It’s something, though, that you can always fiddle with a bit – I might even do that sometimes. Make one with a bit of sugar and another w/o and see what it looks like the next day! Thanks! My bread making skills are pretty limited and I often experience less than great results so maybe I’ll just play around with it and see what works best in my high altitude area which probably also contributes to some of those results. I lived in Georgetown & outside of Frisco Colorado for years and I didn’t have great results with making bread as I recall. But I was young, in my late teens and early 20s and that was decades ago and I was trying to make whole grain and sprouted breads. Thanks for the explanation and the link! Appreciate it. You do not need sugar in bread making as there is enough food in the flour for the yeast. I t is mainly for the taste and the crust. Hi Kathryn, thanks for the weigh in! Now that you mention it , that rings a bell, but it’s been a long time since I did any “serious” bread making! Especially since I usually make this, now! In regard to the water–do you add the 1 1/2 cups of water to the yeast, flour and salt at the beginning and reserve 2 tablespoons to sprinkle over the dough when you are about to place in the oven? Recipe looks great just confused about the water part. Thanks so much! Sorry I didn’t get to you yesterday; have a relative in the hospital; he’s ok now but it was crazy! And yes you are correct; I’ll take a look and make sure the recipe is clearer! Thanks Margie! Hi Shirley, The recipe ingredients and instructions are correct, no sugar. I rewrote the narrative late last year, December, I think. I meant to say four ingredients flour, salt, yeast and water. I don’t know what I was thinking, except for most breads do have sugar and my brain must have been on some kind of automatic mode. This particular recipe does not have sugar which would give it a quicker rise and this bread needs that long, slow rise. Thank you for catching my error and I’ve crossed sugar off that sentence under Making Crusty Bread! This looks wonderful! What kind of yeast do you use? Hi Lynn, I just usually use active dry which I usually use with all my breads. Instant Yeast works fine, too. I guess I could have specified but this works with pretty much everything. I’ve even used rapid rise by accident and it was just fine. There’s not much yeast so I think that’s why even this slow rise worked ok with it. And I’ve tossed in the basic bread machine yeast, which I believe is a strain of active dry, too. I think you’ll like the way this turns out – it’s very low effort for a decent result. I make this recipe too. It makes me feel like I am an accomplished baker! Your loaf is gorgeous! one last question before I make this: what are your thoughts on using my DO to make this? Thanks, Reagan! It is so incredibly easy! 🙂 And the crust is so good!